Selling a yacht can be a big time commitment. However, when it’s time for your business to sell your yacht or yachts or even your luxury yachts your company can rake in some cash and make it extremely worthwhile in the end. You will undoubtedly want to make whatever type of yacht you are selling look top notch, and the best way to do this in 2018 is with an amazing aerial video and the best way to make it make it even better is by using the best video drone you can find. One important thing to keep in mind is that there are many FAA regulations when it comes to flying drones, and the best way to get around these regulations is to hire someone like LA Aerial Image and their team. They are licensed and insured for all jobs. If you do not hire the right person to shoot your drone video this could cost you thousands of dollars, if something were to go wrong such as something just as a simple crash. There are many unique drones to choose from; waterproof drones, splash drones, underwater drones, and simply, affordable drones. Considering all of these options, the Phantom 4 Pro is an excellent choice for making your videos the best they can be. Here is a quick synopsis of the features on the Phantom 4Pro video drone. The Phantom 4Pro is equipped with 5 direction obstacle sensing and 4 directions of obstacle avoidance. The sensor on this drone is the best you can find in today’s market. When you have these features on your drone it will instill more confidence in your flight and you’ll be free to take spectacular drone videos for all of your yachts for sale. So, now that you are aware of the best affordable drone to rent for making the best drone video you can imagine, it’s time to get to work. Here are some tips for doing that. You’ll want to familiarize yourself with the drone as much as possible before setting up the shoot date. You’ll also want to plan out accordingly a shot list. What this means is to make sure you know what angles you want to showcase on your yacht. Such as interior, exterior, ground shots, static and non-static shots. Also, what parts of the yacht you want to focus on most. For instance, do you want to shoot close up shots of the bow? Or, do you want shots of the seating area? Do you want to show the water around the yacht to give the whole feel of the yachting experience? All of these are valid areas to focus on and are great selling points. However, just remember that you know your yacht best and you will know how to showcase it for maximum selling currency. So, you must take some time to think about these things and at least make a plan for the shoot. Even if the list changes a bit when you are in the process. Another thing to keep in mind is it may take two or three days to get everything that you’ll need to make the whole drone video. Contact LA Aerial Image if you need a reputable company to shoot a great video for you if you are not feeling confident with your video and editing skills. 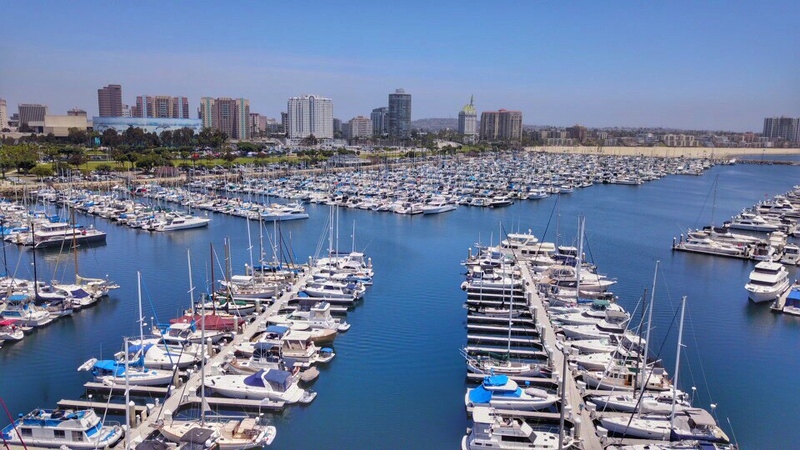 LA Aerial Image has lots of experience and can create a video that will gain attention for your yacht. One last thing to keep in mind, are the people you will be showing the yacht video to. What do they want? What type of video will catch their eyes and have them in a bidding war with other potential buyers for your yacht? Oh, and while you are making the best drone video for your yacht; Have Fun! This entry was posted in Uncategorized and tagged advanced social media marketing, boat, boat sales, boating, boating sales, drone, long beach, los angeles, real estate, sales, social media, social media marketing, social media marketing plan, social media videos, video, yacht, yacht club, yacht for sale, yacht rentals, yacht sales california, yacht sales los angeles, yacht sales near me, yacht sales newport beach.